Friday October 4th 1901 I did more painting of furniture and the usual work. They got a good start on the house today Ida and I went for crab apples and after that I went to town. Lib came for Mollie tonight. I put up tomatoes after supper. Saturday October 5th 1901 We put up pears and peaches and did baking in the forenoon. put down a carpet in my room and put things to rights in the girls room. Will helped and they got the roof on the new building. Dell has hauled a load of corn from the valley every day. Sunday October 6th 1901 Ida and I were both busy about the house most of the forenoon. Will went to the pasture and did not get home till noon. Ida was away all afternoon, Dell all day and Mollie did not get back tonight. 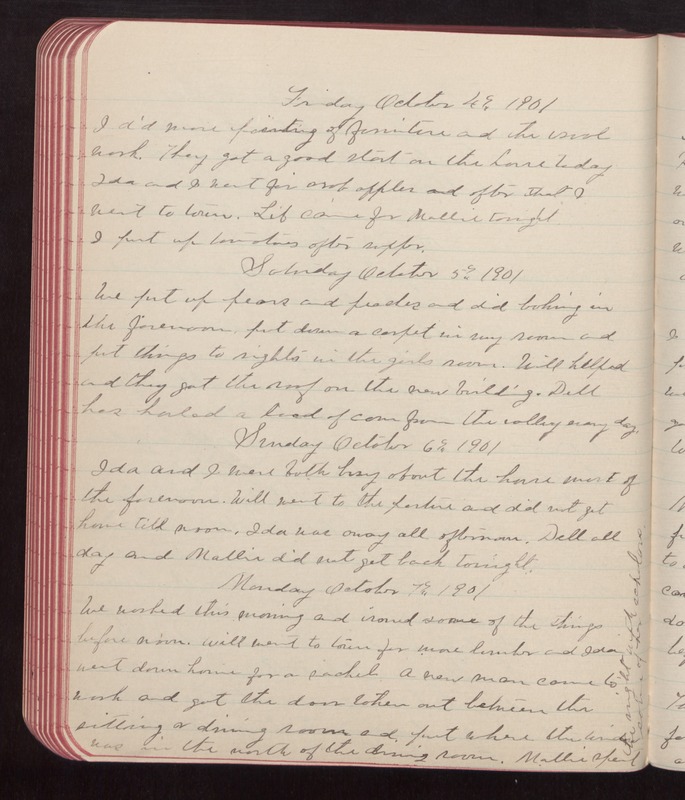 Monday October 7th 1901 We washed this morning and ironed some of the things before noon. Will went to town for more lumber and Ida went down home for a sachel. A new man came to work and got the door taken out between the sitting & dining room and put where the window was in the north of the dining room. Mollie spent the night with some of her scholars.